Any report about the Exhibition will be subjective of course but I hope to be as fair as I can in making my remarks about the 31st Exhibition which for some reason I had been looking forward to more so than at any time in the last decade. I have decided to review the show by using what I call the Exhibition Six-Pack. These are six subject headings that matter to me. The reader may have a different view but, well – this is mine. The headings are organisation, venue, livestock, staff, traders and ‘other activities’. The BTS Exhibition is the Societies’ flagship event, known throughout the world. It has a long standing reputation as one of the invertebrate meetings to attend. You miss it if you dare. The task of organising such a prestigious event cannot be left to just anyone. Ray and Angela Hale have been the driving force behind it for more years than I actually know and it is hard to conceive of anyone else doing the job. They are to the BTS Exhibition what Michael Eavis is to Glastonbury. Most people can only guess at the amount of (voluntary) time effort – and money – they invest in making sure that we all have an unforgettable day. They literally bring the spider world together! The exhibition has been held at several venues down the years and this was the first gathering at the Warwick Exhibition Centre. Based on conversations I had with people throughout the day that it was an instant hit. I would imagine that the big issues to take into account when selecting a venue are factors such as access to and from the venue, parking, capacity, materials in house (tables!) refreshments, toilets, disabled access, first aid and more. It ticked the boxes! I like the fact that it was all on one level. 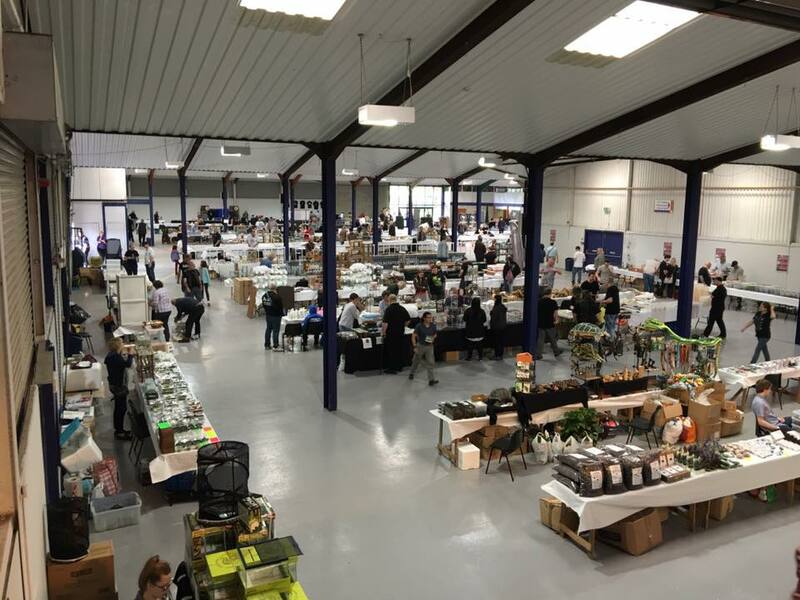 It was bright and airy and there was plenty of space for traders and visitors. The toilets were spacious and clean and the food seemed to me anyway to be just the ticket. I know that the purveyors of this fayre ran out of much of their stock before the final bell rang. I thought it was reasonably priced and the staff served with a smile. By livestock I simply mean tarantulas! Of course we know that there are other wonderful creatures such as scorpions, millipedes, centipedes, snails, mantids, stick insects and many more but the focus of a tarantula show has to be the tarantula. Looking around I thought the quality of specimens was of a very high standard in general and there were only a few dubious and sorry looking animals on display. Labelling of specimens seemed better than ever but I would like to see more traders giving out care sheets, especially with CITES animals such as Brachypelma smithi. I could be wrong but again my own view from walking around was that there seemed to be an increase in captive bred stock which pleased me greatly. It is though important to bring new stock (and some will be wild caught) into the hobby but the balance seemed to be about right. I must comment that I do not like to see huge spiders rammed into small containers where they cannot stretch their legs fully. This is just wrong and I would ask people to consider it regardless of space issues. Animals first – space and profit second. Specimens should where possible have access to water too. 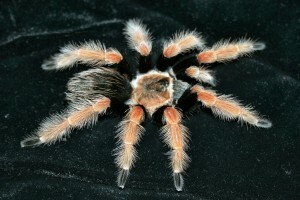 That aside, I was very impressed with the variety and condition of tarantulas available for sale. By this, I mean BTS staffing; not the Warwick venue employees. Ray and Angela may be the big chiefs but there’s no way that this event could occur without the stellar (and voluntary) efforts of the unsung heroes that deliver on the day. BTS members can enjoy simply arriving on site, parking then going shopping for their favoured spiders all day. Yet much happens behind the scenes without people knowing. It is planned for months. It would just be unfair for me to pick out certain names (I would be bound to miss someone out) but the BTS committee have a roster to work to which involves staffing the entrances and exits to the site and building, sorting out tables, liaising with in-house staff, answering any number of exigent questions, dealing with any incidents like illness or accidents and running the BTS spider competitions which I will mention shortly. I am yet to mention the busy task of staffing the BTS tables and making sure that everyone gets their favourite tee-shirt and memento of the day. The ‘operation clean-up’ task is something most people miss too – they are already on their way home with their little charges whilst the now tired BTS volunteers are still slaving away. They do this without complaint and without expectation of a thank you. They all ensure that it is our day – a day for us members and our families and friends. I simply have to mention that our editor, Michael Jacobi comes all the way from the United States of America to be at the exhibition and he puts in one mighty shift. He was one of the gentlemen staffing the doors from early morning making sure that everything went smoothly. That is commitment; that is dedication. We absolutely must extend thanks to Michael for this remarkable feat and we are so proud and lucky to have him as our editor and as a member. 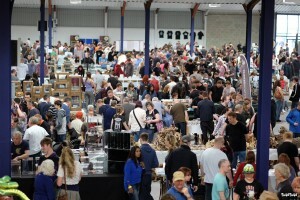 I was very impressed with the sheer number and variety of traders this year from the UK and abroad. You could buy anything from cork bark, to vivarium’s, seashells, jewellery, clothing, books, invertebrates of all kinds and even fluffy jumping spiders (a new and rather enterprising move) as well as beautiful wooden sculptures. 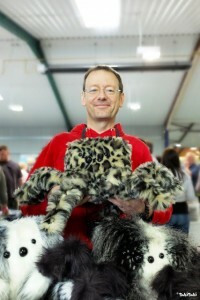 I will be bold here and pick out the British Arachnological Society stand which was manned by Richard Gallon. I believe that we (the BTS) have a table at their show and they come to ours which is mutually beneficial. British spiders are incredibly interesting and oft overlooked. Richard revealed something quite magical through the microscope on his table. His boyish enthusiasm was evident as he invited me to ‘have a look at this’ and when I observed the tiny but magnified specimen in the petri dish I was astonished. It was a common old money spider but its eyes were (best described as) on a stalk. Oh my word. The world of small suddenly became the world of blow me away. Of all the beautiful spiders from around the globe available that day this British beauty was my winner and I really have to share the image which Richard cleverly captured. This demonstrates to me that the exhibition is about much more than just theraphosids and interest is literally around every corner. Thank you Richard; that really did make my day. I want also to mention the important issue about traders helping the general public with their many questions about keeping spiders and other animals. They were generous with their time and knowledge and clearly not there just for money – they really do want to see others, especially the younger members taking up the hobby and developing an interest in natural history. It was so uplifting and encouraging to observe. I know that many traders breed their own spiders and other fauna and are often loathe to sell them, they love them so much. It is always hoped that such specimens go to loving and knowledgeable homes. What do I mean by other activities? Well, the exhibition is not just about buying and selling. 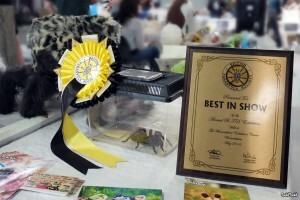 The well-established BTS competition for best spider in show and several other categories appears to be in as much demand as ever. I am sure the list of happy winners can be found online and I am only sorry that I forgot to bring one of my own spiders to see how she would compete! Best spider, artwork, and photography are all included. You can be as creative as you wish. What’s there not to like? There’s plenty for young and old. I remember back in the day when I won some prizes and I was – and remain – very proud to have done so. It’s the Crufts of the tarantula hobby in my view. Oddly – other activities might include ‘networking’. The exhibition is a tremendous opportunity to meet people and exchange ideas and contact details. This must never be underestimated. It forges friendships, helps support businesses and most of all keeps the hobby going! I had a super day and stayed to the end. I purchased only three specimens but I gained as much delight in them as I did when first I took up the hobby. It would be unfair of me not to mention my lovely Aphonopelma seemanni – the first spider I have actually added to my collection for years. What a thrill. I have never lost my love and fascination of invertebrates and the BTS show reignites that passion every time. The day was a temporary escape from everyday life and an opportunity to see friends old and new. True, it is a tarantula meeting but I am reminded as I get older how special the human aspect is. We are a very close-knit community. When I see a trader talking to members of the public about spiders with the same vigour and zeal as he/she did 20 years ago I realise just how lucky I am to be a member of this community. There’s a sense of intimacy about it all. I don’t want to steal anyone’s thunder but a very special moment occurred when the oldest BTS member was photographed with the youngest. I am sure that the Hale’s will put some detail around this magical moment but it showed the breadth of interest that the hobby has. It will always appeal; it will always educate and it must always prevail. 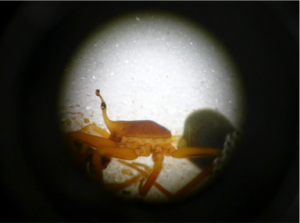 One of my family members who visited for the first time (he does not keep any animals) said that he was amazed how – despite initial impressions that some folks looked a little scary – everyone was approachable, enthusiastic and passionate about invertebrates. They were good humoured and happy! That’s all that needs to be said. Personally speaking I felt that the 2016 Exhibition was the best yet, testament to everyone involved in making it the remarkable day that it is. Roll on next May.